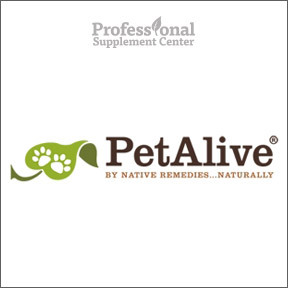 Professional Supplement Center now carries PetAlive®, a line of effective natural solutions designed for pet health. PetAlive® offers easily administered herbal and homeopathic remedies that provide effective relief from ailments commonly experienced by household pets. Much like their human companions, domesticated animals are subjected to the hazards of modern living and can be affected by pollution, poor nutrition, stress and unhealthy lifestyles. PetAlive® provides fast acting homeopathic remedies that aid symptom relief and support long-term health naturally. To ensure quality, safety and efficacy, PetAlive® products are manufactured in accordance with uncompromised cGMP pharmaceutical manufacturing standards in an FDA registered facility. Only the highest quality, laboratory-tested raw materials are utilized. PetAlive® formulas are manufactured under the supervision of herbalists, naturopaths, homeopaths and pharmacists, and are formulated with a combination of natural medicine, documented traditional medicine and clinical research on herbal and homeopathic ingredients. Whole and wildcrafted herbs are utilized in herbal remedies formulated for complete holistic health. All homeopathic remedies contain ingredients that are listed in the Homeopathic Pharmacopoeia of the United States (HPUS). Ear Dr.™ – Suitable for both dogs and cats, these herbal ear drops may be used to alleviate itching and discomfort and reduce constant scratching of the ears. Bioactive ingredients help to maintain normal levels of ear wax to keep the ear canals free of blockages, relieve ear infections, control mite infestations and aid in preventing the spread of ear mites to other household pets. Allergy Itch Ease™ – Dissolvable granules may be sprinkled directly into the mouth or mixed with a small amount of wet food to support the health and integrity of skin cells and provide temporary relief for symptoms of skin allergies, such as excessive chewing, licking or scratching. This 100% homeopathic formula is suitable for dogs and cats. Cushex Drops-S™ – This proprietary liquid herbal formula supports endocrine balance to help maintain normal adrenal and pituitary functions, promote healthy skin and coat, and support energy and electrolyte levels, appetite and digestion. Safe and effective for both dogs and cats, these 100% herbal drops support adrenal health without risks of side effects. This entry was posted in Home and tagged Allergy Itch Ease, Cushex Drops-S, Ear Dr.. Bookmark the permalink.